Mega Man Star Force explicitly states that it takes place approximately two-hundred years into the future of Battle Network, thus placing it into the network timeline. Set in the fictional year 220X, emphasis on internet technology has lessened, and instead, the world has become networked through use of EM waves. Though cyber worlds and NetNavis still exist in Star Force, human dependency on them has greatly decreased, and people no longer have Navi companions. Three large satellites orbiting the Earth—Pegasus, Leo, and Dragon—power the EM Wave World that exists around the Earth's atmosphere, keeping the world networked. While the EM Wave World is normally invisible to the human eye, a special piece of eye-wear called the Visualizer (possessed by the series' protagonist) allows a human to see this other world. However, like with the cyber worlds of Battle Network, EM Wave Viruses inhabit the EM Wave World, causing problems in every day life. 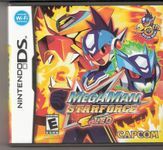 Source: Wikipedia, "Mega Man Star Force", available under the CC-BY-SA License.